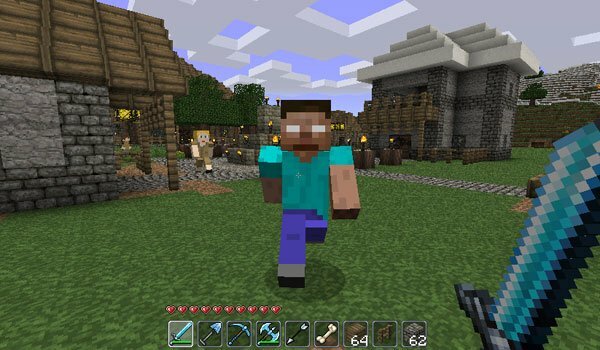 Herobrine returns for the current version of Minecraft, willing to make your life become impossible. Herobrine 1.7.2 and 1.6.4 aims chase, prepare TNT traps and make your life miserable through several actions against your character. This fellow with white eyes won’t let you to stop moving the mouse from side to side, trying to anticipate their movements but not always you’ll get it, because he appears and disappears very quickly. Although you should remember that you’ll need to use his totem to invoke him in your world. How to install Herobrine Mod for Minecraft 1.7.2 and 1.6.4? The legendary Herboine it’s already! I ran the installer and clicked install, and it said error in opening zip file. What do i do? can i use forge for this? Everytime i try to play minecraft now, it crashes do to this mod. What do i do? Why does it not work sometimes? It will work when i build the totem sometimes but other times not. make a new downlod PLZ!!!!!!!!!!!!!!!! builder herobrine dies 3 seconds after I spawn him with a spawn egg. Why?